France or England, ca. 1260-1270. English brown Russia with gold-tooled border, ca. 1800; lettered on back: Biblia Sacra MS; in red morocco case lettered: The Frome or Edindon Bible. English XIII cent. Early owners: Frome (15th century) and Edindon (ca. 1500), possibly religious houses; collection of Thomas Hayward Southby of Carswell; his sale (London, Dec. 10, 1890, no. 173) to Quaritch, catalogue 118 (1891) no. 86, and catalogue 138 (1893) no. 18; William Morris; purchased in 1897 by Richard Bennett (purchased from Morris's estate, 1897); Catalogue of manuscripts and early printed books from the libraries of William Morris, Richard Bennett, Bertram, fourth Earl of Ashburnham, and other sources, no. 3; purchased by J. Pierpont Morgan (1837-1913) with the Bennett Collection in 1902; J.P. Morgan (1867-1943). 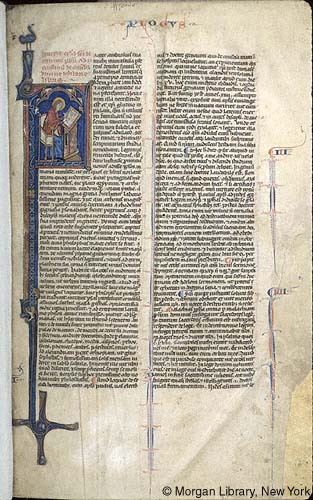 Ms. Bible; written and illuminated in France or England, ca. 1260-1270. Decoration: 84 historiated and 57 decorated initials.